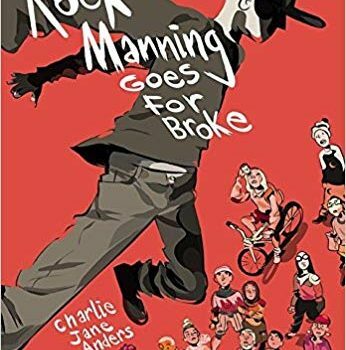 Rock Manning Goes for Broke, Charlie Jane Anders (Subterranean 978-1-59606-878-0, $40.00, 128pp, hc) September 2018. 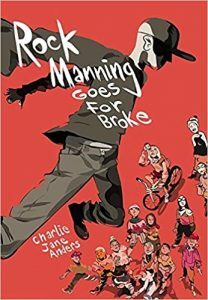 When Kingsley Amis coined the very useful term “comic inferno” back in 1959, he wasn’t thinking of Harold Lloyd comedies, and certainly couldn’t have imagined the sort of Jackass-style homemade movie stunts that are at the heart of Charlie Jane Anders’s novella Rock Manning Goes for Broke. But the term is a pretty useful description of the slapstick-in-the-face-of-apocalypse attitude of Anders’s characters, especially the eponymous narrator Rock Manning, the son of a second-rate movie stuntman whose idea of teaching the five-year-old the ropes consists of throwing him off the roof of the house. Rock learns to use his pratfall skills as a protective measure against school bullies, and eventually finds a kindred spirit in Sally Hamster. The two begin to make outrageous stunt videos which, aided by Sally’s animation skills, become viral sensations. One reason behind their popularity is that people are clearly in need of diversions. Rock and Sally are coming of age in a violent post-Trump­ian dystopia, with a collapsed economy, food and credit riots, an out-of-control opioid epidemic (with far more powerful opioids), a reinstated military draft, frightening new superweapons (one of which causes widespread deafness), a vastly weakened federal government, and a powerful enemy alliance called the Pan-Asiatic Ecumen, which is suspected of being behind the drug epidemic. Even professional sports have faded away. One of the bullies who tormented Rock becomes a leader in a grassroots fascist movement known as the red bandannas, and convinces Rock and Sally to produce a propaganda film for the movement. By now, though, Sally is in film school in Boston, increasingly concerned with the integrity of her art vs. propaganda vs. the escapist entertainment that she and Rock began with. 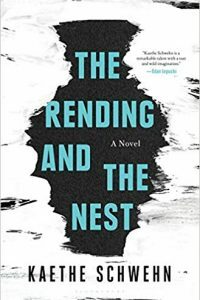 It’s easy to read all this as Trump-era absurdism, and the questions that Sally raises about art, entertainment, and advocacy are questions that a lot of writers, not only in SF, seem to be asking themselves these days. When a talk-show pundit claims the only real issue is to “stop the flow of drugs into our country, even if we had to defoliate half the planet,” and that “If we could just stop the drugs, we could fix our other problems, easy,” the simple-minded demagoguery, along with the unabashedly violent rhetoric of the red bandannas, sounds too familiar for comfort. Amis’s idea of the comic inferno referred to the exaggerated satire of social trends in the work of authors like Frederik Pohl; in Anders’s manically entertaining version of it, satire gives way to slapstick, and the exaggerations, hilarious as they are, seem unnervingly unlike exaggerations at all. 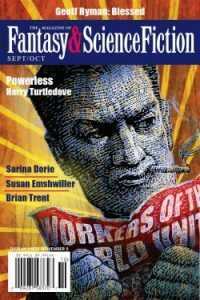 This review and more like it in the September 2018 issue of Locus. The link at the top of the review does not go to this book on Amazon, but to https://www.amazon.com/dp/031624662X/?tag=locusmag06-20, which is Ancillary Justice.